Greetings dear readers, it is I, Boris Excelsior blogging once more. By now you’re all too familiar with the strange creatures with whom I dwell. Somehow they suffer an ontological blindness to reality (save the chickens, they see all). They are like people chained to the walls of a cave seeing only shadows on the cave walls. This leaves them in an odd state (though perhaps their ignorance is a blessing). I know too well the nature of our cruel authorial overlord whose completely derivative tropes, shallow whims, avoidance of metaphors, tortured prose, literary floundering, poverty of figurative language, and annoying tendency towards alliteration leave me in endless despair (and don’t get me started on the photos which strangely focus on hedgehogs over bears). Lastly, as the protagonist, you’d think I’d be more central to things, but sometimes the foolish author forgets me altogether(! ), more evidence of my point. Back to the others, they see only their world of appearances rather than reality, where their random wanderings from some improbable situation and lingering threads of plots are invisible. I feel like I am Owl from Winnie the Pooh, seeing all, knowing all, a fount of erudition, and another protagonist who strangely isn’t present as much as might be expected. I envy the others in some ways, free from seeing the literary crime that is my universe. Yet, their ignorance seems to be at the root of their lingering character defects (especially the cows). Take Jane, the unbearable. This bear bears umbrage at her bare cruelty. Perhaps her controlling passive-aggressive ways are a product of a complete lack of free will, dictated upon her by authorial cruelty, but I believe it to be deliberate choice. Those little notes complaining about the missing donuts, the way she hides pie, the subtly harsh way she sips coffee, it must be an indicator of some kind of vicious consciousness, no matter how dim. 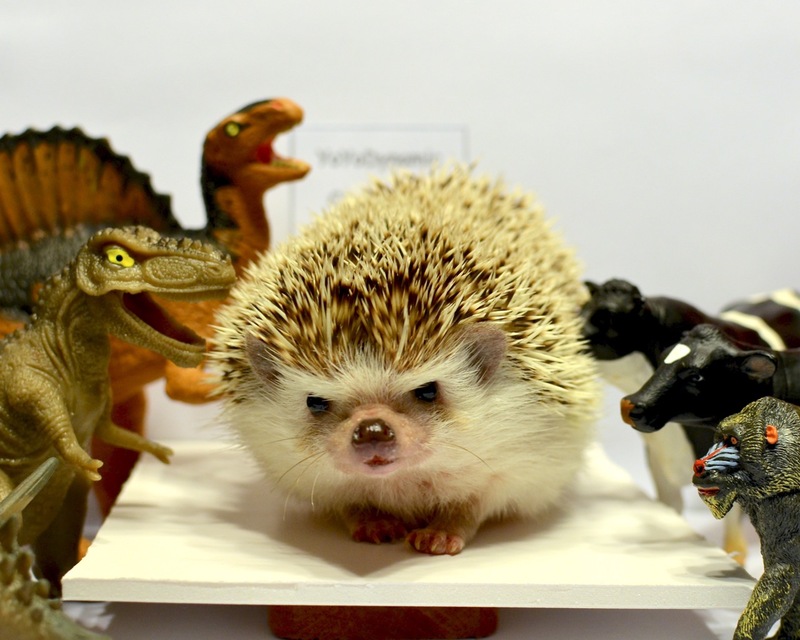 And then there’s that hedgehog. She’s sweet, and while perhaps sophisticated in manners, that sophistication ends with her intellect. Perhaps free will is inapplicable and she’s driven by instinctive etiquette. When she opens her mouth it’s probably innate to endlessly endorse etiquette while abusing alliteration. And that alliteration! Always an abominably awful attack against articulation. Cringe-worthily contrived composition. That’s all for now, more musings soon. Much to say about that accursed monkey and I have some thought to share on deconstructionism – the concept of the death of the author is fascinating. Off to the book club with the chickens, we’re reading Dostoevsky. 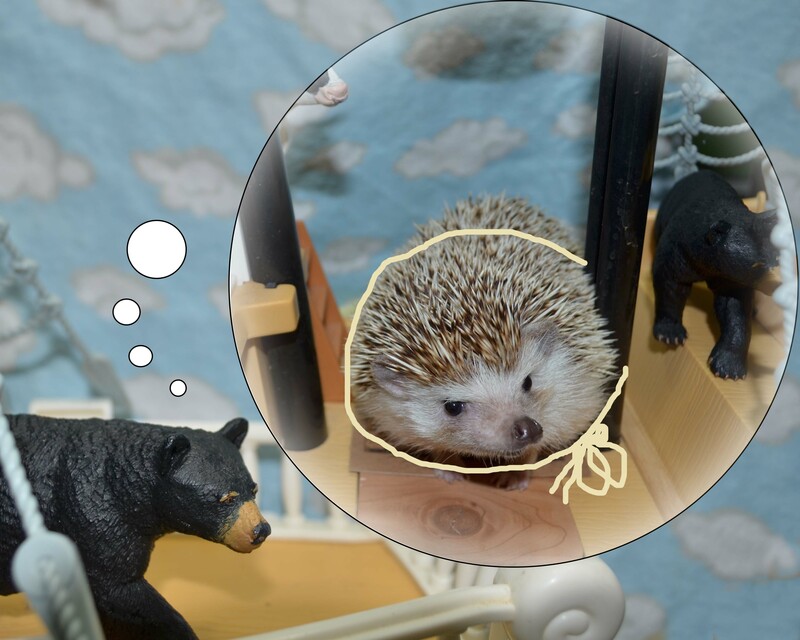 Princess Pricklepants’ Somewhat Distracted Guide to Manners, Monkeys, Etc. 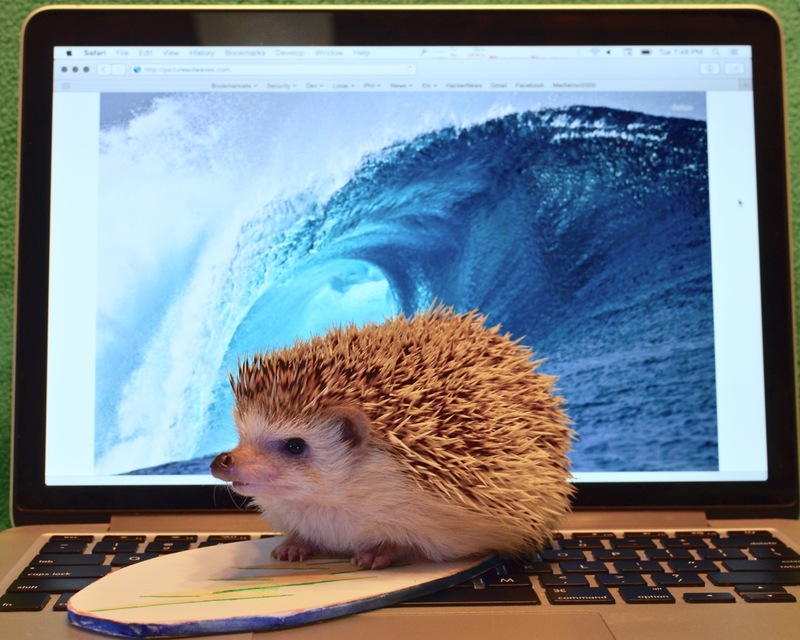 Something odd happened recently – a story from our humble blog wound up briefly on the front page of a tech news site (news.ycombinator.com) – naturally it was Princess Pricklepants, Startup Founder Extraordinaire. So we got a lot of visits for a bit and were for a very brief moment slightly more famous (9,000 hits in a day), though things are largely back to normal now. There are a lot of words in this, our latest post (more than two thousand five hundred – sorry for the wordiness), so we’ll keep this preamble succinct, pithy, and free of superfluities, and will not drone on in a long run-on sentence about how brief, concise, and terse our intro. is, but rather will press on into the body of our story with no delays, distractions, or pointless diversions. And so we begin with our first picture with words under it. Please do not leave the refrigerator door open. Please also be sure to help clean the dishes. While doing so, please do not throw any more dishes. Once again, Buenos Aires is the capital of Argentina. In addition, please stop harassing the alligators. That font was all wrong, so she tried out different fonts for a while, bumped the font size and adjusted margins, and then went to Wikipedia to check on something. After a brief voyage through the Wikipedia spiral of distraction, she found herself logged onto the PrincessPricklepantsCentral Forum. Hello, did anyone think of a job for Monkey? No. We’re all just avoiding the obnoxious food-stealing monkey. Hey, you know why the monkey liked the banana? It had appeal. Some of us are also avoiding the obnoxious food-stealing bear. You know what you call bears with no ears? B. Sounds like someone is a mad cow, maybe it’s time for your check-up? What do you get when you cross a bear and an elephant? A revocation of your research grant and a stern rebuke from the ethics committee. So everyone, shall we have a meeting to go over Monkey employment then? These forums seem too… frivolous. It’s Sunday. Maybe we should hold off until tomorrow, then we’ll be able to call around to see if anyone will hire Monkey. Also, agreed, Boris’ jokes are becoming unbearable. She logged off the forums and tried to catch up on email. 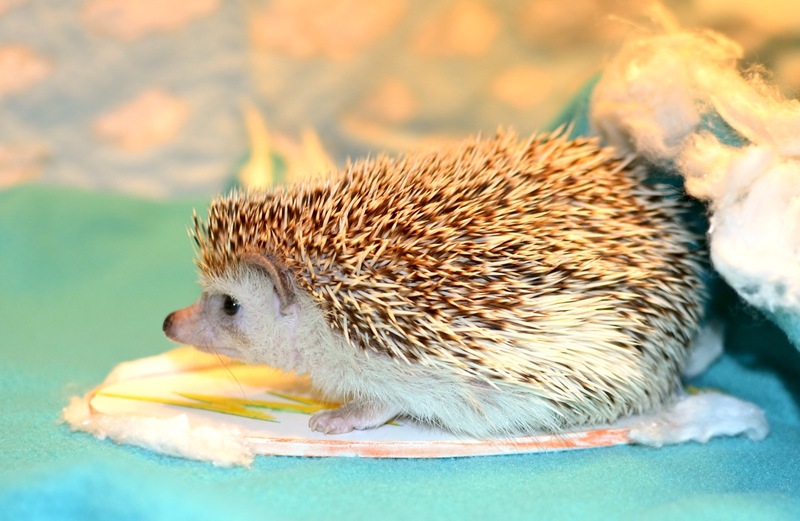 Being a hedgehog, her eyesight was poor. Happily, when she had difficulties reading things she went by smell which worked remarkably well (as far as she could tell). 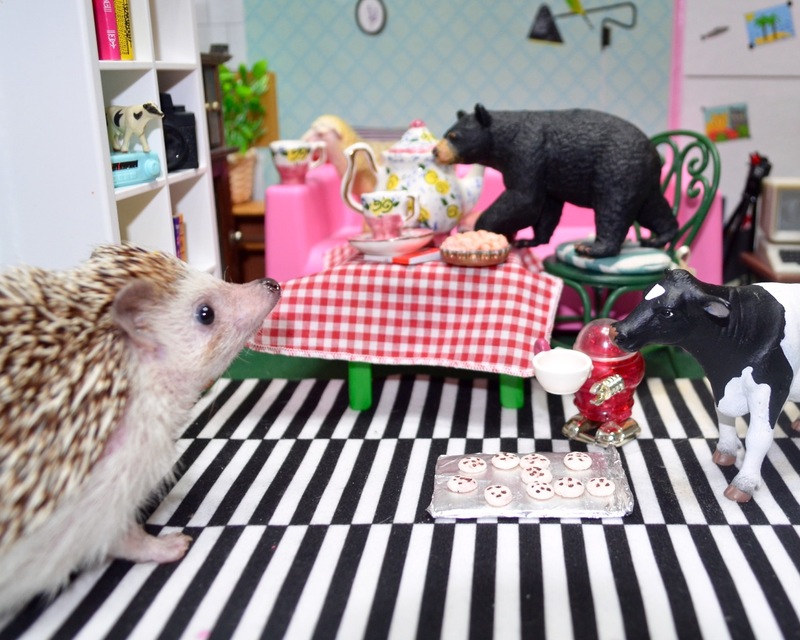 Dear Princess Pricklepants, I try to be a polite, refined, well-mannered person, so naturally I have been throwing tea parties. I’ve been getting great ideas from Pinterest. Recently my husband, Ned, has been joining us at the parties, which is nice except that he eats the kale and quinoa salad with his fingers, and drinks his hot tea in a mason jar. I’ve told him that mason jars are not for tea, but are for lemonade (or for candle-making, creating a sewing kit, toy storage, crafting, holding tortilla chips, salad, cocoa mix, potpourri, etc.). How do I convince him to be more genteel and refined in the ways of proper manners at tea? Touching non-finger-food with hands and touching all the cookies – troubling manners. Dear Penless Page, thanks for writing. Table manners are oh so very important, and a domain in which I have an extensive background. Let him know that the appropriate way to eat is to sniff out food, then bring one’s snout to the food dish, grab the food with one’s mouth, or perhaps slurp it in a bit with one’s tongue (provided it’s long enough), then crunch away. That is, until the monkey shows up, grabs the food with his hands, then throws it, and the food spills everywhere, leaving you very confused, while your attempts to teach manners and geography are completely ignored. Gently suggest to your husband that using his hands is being like that monkey, and nobody would want to be like that monkey. Don’t be that monkey. Dear Princess, my kids and my husband will wander into the kitchen, go straight to the refrigerator, and then just stand there with the door open staring into the void. It drives me crazy – it wastes electricity, risks food going bad, and it’s just plain frustrating. What can I do to help others to break free from their former lives as fridge dwellers? When a person, beloved pet, or monkey spends a long time lingering in the refrigerator, this might be because they have already eaten all of your food and are just wishing more would appear. Or perhaps they just love the rich and interesting smells that refrigerators emanate (such a fascinating bouquet). But if you ask politely for them to stop, and they act like a tricky monkey, then I’d recommend you write a note and place it on the refrigerator. Be sure to use a nice font. Make sure the note is polite, thoughtful, and kind with a clear helpful lesson on manners (and perhaps geography), so it can ultimately lead to an outcome somewhat like the plot of My Fair Lady, with singing, dancing, and a somewhat ambiguous ending. My husband Vern is a good man, but he brings toast, cookies, crackers, and even cups of tea into the bed all the time while sitting to read. He creates terrible messes! What’s a polite way to tell him to stop bringing food to bed? Too often one may find oneself in the situation of a person or monkey climbing on one’s bed, eating bananas and leaving the peels all over, spilling drinks, jumping on the bed, and even throwing pillows. To deal with this, hold a household meeting to discuss a plan to deal with the bed crumbs. Then have a followup meeting to go over the plan’s implementation details, followed by a series of pre-planning meetings for each item, and ideally some off-site training. At some point the amount time used by all the meetings and preparation will be so great that there will be no more time for bed eating/hopping/sleeping/etc., and the problem will be solved. Be sure to follow Robert’s Rules of Order. I have a lovely 17-year-old step-daughter. Recently she has developed a lot of anger issues and has loud, tantrum-like outbursts where she curses out her father and me, and says very hurtful things. She even called me a witch! What can I do to bring her in line? I think you may have written in before, when I was interrupted due to some dinosaur-related business complexities. Apologies if that’s so. Witch accusations are no laughing matter, and not to be taken lightly. They must be followed up by a proper trial. Our favorite method for testing whether someone is a witch is to build a large set of scales and weigh the accused to see if they weigh more than a duck. If they weigh less than a duck, then they’re a witch. If you find they are a witch, ask them which house they were sorted into to, ask if they’ve met Hermione, and see if you can help get a teacher to reward their house points. Also please let me know (unless they’re in Slytherin). I’ve been looking for the secret passage to Diagon Alley for a very long time with no luck yet. I love the Harry Potter documentaries, and really would love to visit the wizarding world. -Her Royal Highness PPP Grand Duchess of Tiggy-Winkle, Defender of Hufflepuff, etc. My husband is a bit eccentric. Or, well honestly, really eccentric. 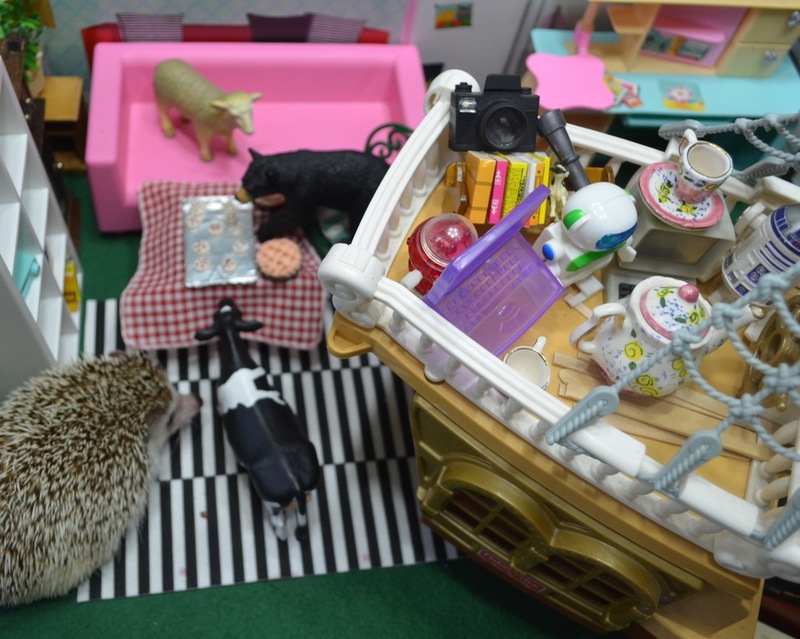 He is a photographer who creates little sets with miniatures and props for his photos (he even puts our pet in the photos sometimes). It’s a hobby and seems to make him happy, I suppose, though it’d be nice if he cleaned up his mess more. Sometimes our nieces and nephews come over to visit and treat his photography equipment like toys, which bothers him. How do I get him to put his equipment away before people come over? That sounds like a really wonderful hobby. 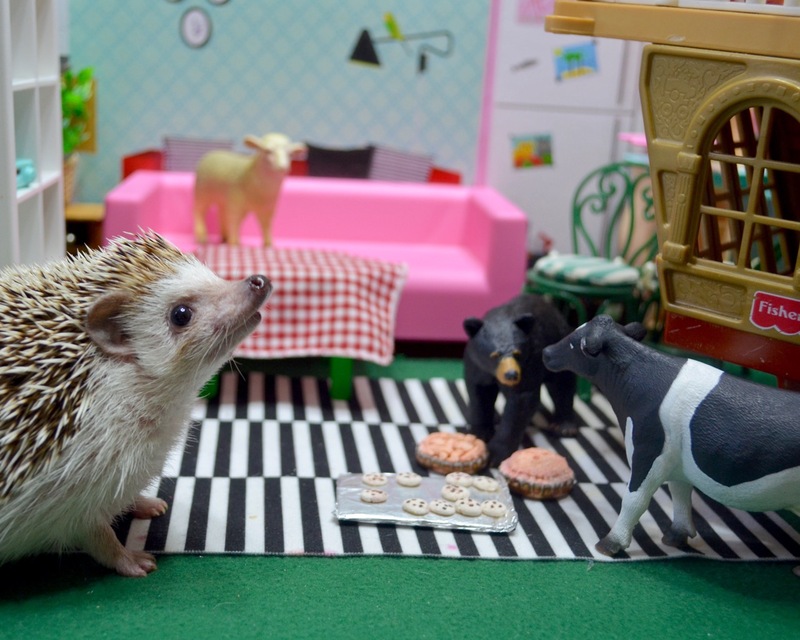 We have a doll house also, and enjoy putting our toy cows and animals in little scenes, though recently we’ve taken on a monkey in residence who has been ruining our setups, creating general chaos, and leaving banana peels in the tiny, carefully set up doll rooms. It smells like you need to get a lot more toys for your husband’s doll house so that if there are visitors they can play too. Sometimes at work (I work as a programmer writing robot controller software and internet forum software) I like to read Facebook or hit Pinterest or read Cute Overload. My overbearing cow-orker Jane has become a total control-freak, insisting I focus on my work and nothing else. How can I tell her to loosen up a bit? We’ll put this on the agenda for the next meeting. I’m fairly sure we just need to get an outsider from the big city to come in and teach us about modern music and dancing to loosen things up and revitalize the spirit of the repressed townspeople, but this will need discussion. Due to tangled reasons involving a turgid plot too difficult to describe for both emotional reasons and time limits, I’ve wound up with a horrid monkey living in my home. It eats all the food. It is a conniving, cruel taker of snacks. With the monkey menace so serious, I feel that it would be courteous to wage guerilla warfare against the monkey. I was thinking that we could let the Universe decide whether the monkey should stay here by loading the monkey into our catapult and flinging the monkey far, far away. Please tell me that this is the polite thing to do. It smells like it’s not so much manners you’re worried about here, but your food. Instead of trying to throw the monkey out of your world, help Monkey to improve as a monkey – be the changed monkey you want to see in the world. Regarding the catapult, it’s never polite to fling monkeys with catapults inside. If you take the catapult outside its polite to fling jewel encrusted antiques, rare glasswork, a cat, or other items that would be fun to watch fly, but not monkeys. Perhaps you could take Monkey on a trip to a farm where Monkey could live happily? I believe we’ve established that deliveries are Jane’s job. It’s polite to lock Monkey in a cage, right? It feels very polite to me. I would mention my concerns about the lack of plot development with this episode, it’s like this whole post is just a pernicious plan by a particularly peculiar person to post pictures of their pet posed with pleasant pint-sized props and pen pleasantries rather than pursue a proper plot. At this point I have to say that I truly feel that my rights are being violated by being used in this way, and plan to contact Amnesty International’s fictional bear’s rights program. Regardless, I know you will just ignore it. How do you always manage to ignore these pressing literary matters? Caging monkeys – probably poor manners. I am fairly sure it is not polite to put monkeys in cages. I checked Haley’s 2007 etiquette guide, but it didn’t say anything one way or the other. On an unrelated note, I have happy news. I’ve discovered something that Monkey is very good at. Monkey is a skilled and talented illustrator of poor manners. I think we should give him a job as a politeness model for every conceivable item in the “do not do”column. It seems fitting that Monkey’s purpose in life is to serve as a warning to others. In our next episode, will we just forget the monkey and finally get to Princess Pricklepants and the Live Action Role Playing Game? Will we just wander and digress pointlessly some more? 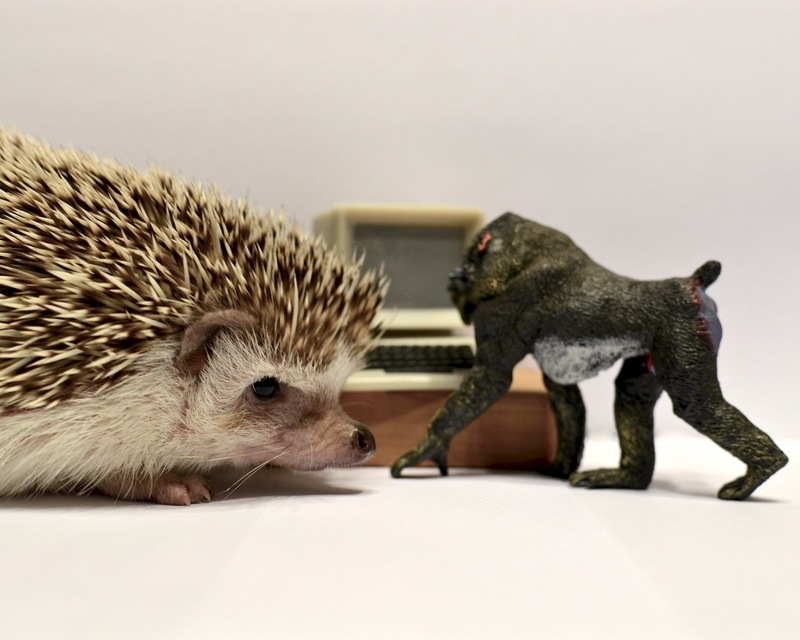 Will we stick with the monkey so we can do Princess Pricklepants and the Code Monkey? Will an homage to Curious George appear starring Her Highness as the Hedgehog Princess in the Yellow Hat? Tune in eventually when we finally get to publishing the next episode to find out what happens next. With the Holidays things will be spotty. In the news, we’ve got two items for you. First, you won’t ever have to worry about fame going to our head. We made the mistake of looking at Alexa, a site that shows the relative popularity of web sites. 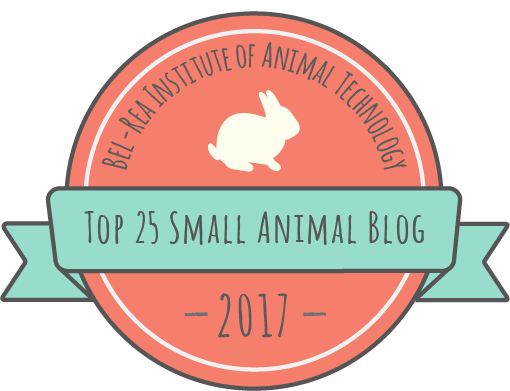 Our humble blog is now even humbler after seeing that we’re the 5,568,903th most popular blog on the Interwebs. But that means you, special reader, can show how much cooler you are to your friends by referencing this very blog which they definitely will never have heard of. Second, we didn’t have another item, but felt badly about only having one. Third, with the holidays looming, we might be a bit spotty on posts. Fourth, we really had a second item, but got to it third. Sorry for the confusion. Her Highness endured the trip back from the island with some discomfort, but they made it back home. 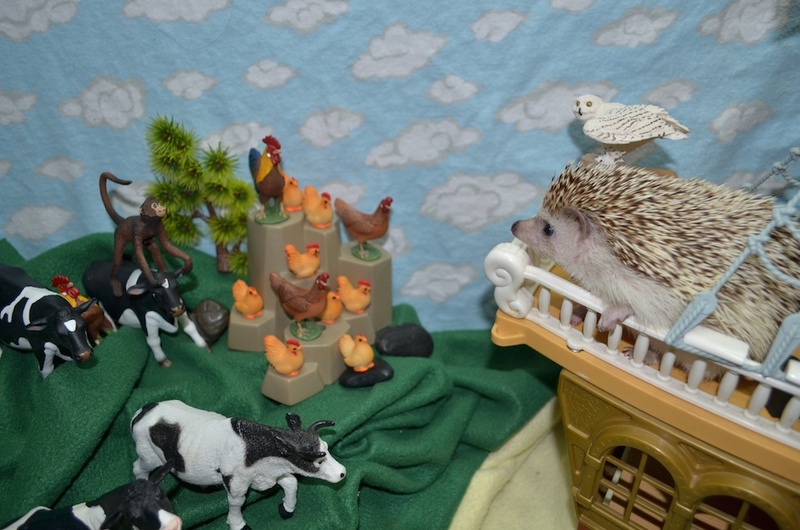 There were some problems finding a new home for the chickens and monkey. 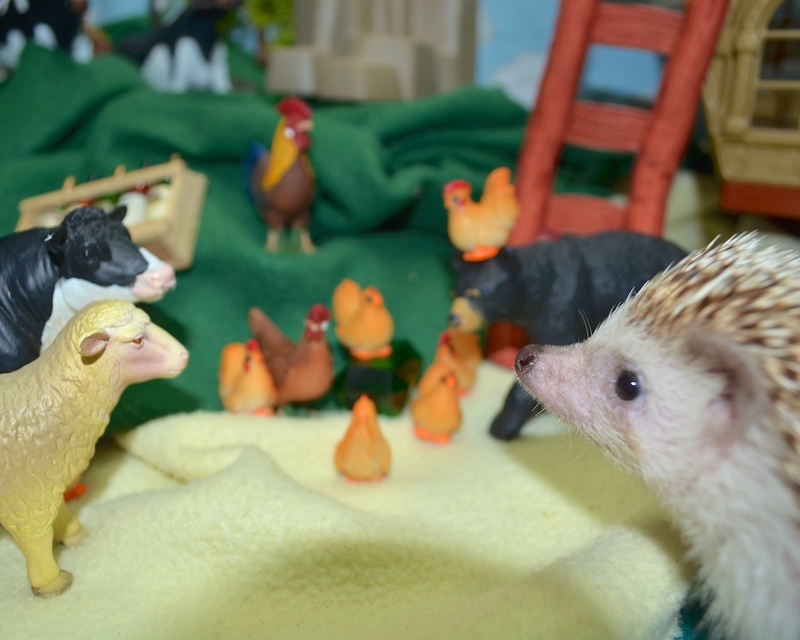 Her farmer friends on hedgehogfarmercentral.com already had too many chickens and monkeys, so they had to stay at her place until arrangements could be made. As a result of the new guests, Her Highness was having a very trying morning. 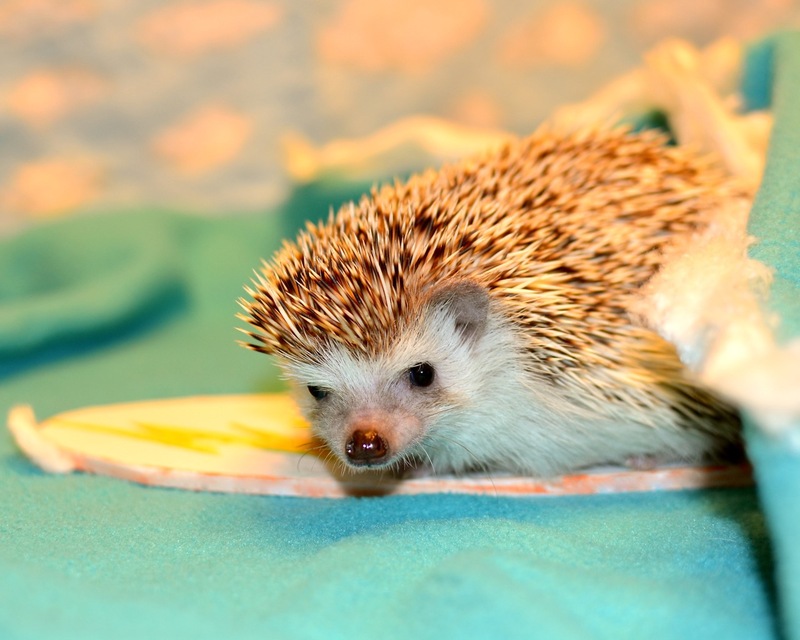 So trying indeed, that these were the times that try a hedgehog’s soul. Things had been oddly unpleasant since the return from their great adventure. 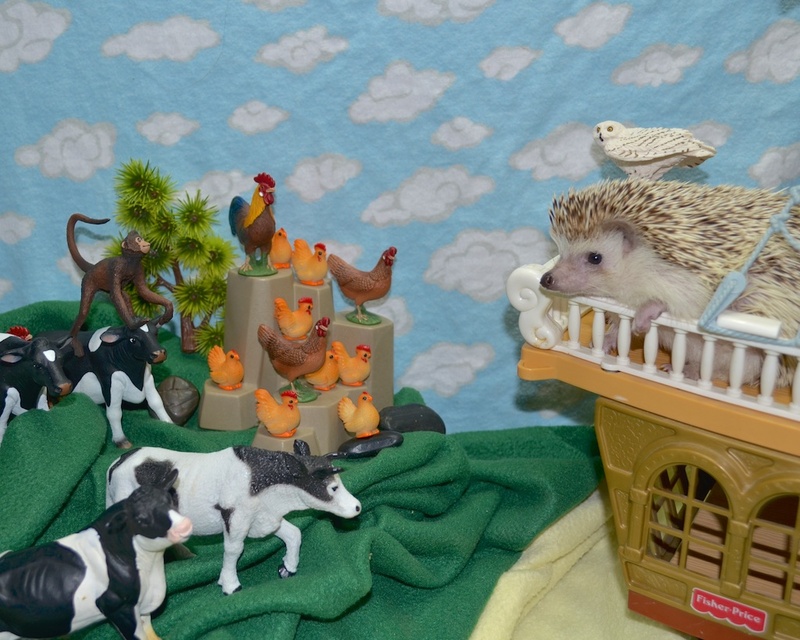 Chicken noise, chicken mess, and other chicken problems were piling up around her home. But the chickens were the lesser concern. The greater was the monkey business. At first the monkey had seemed nice enough, but for some reason the monkey refused to speak. It just said “ooh ooh, aah aah” and then jumped around. Sometimes it threw things that definitely never, ever should be thrown, like pillows. It was a troublingly monkey. While Jane wasn’t pleased by the chicken who’d decided to use her head as a nest, the monkey put googly eyes on Her Highness’s hindquarters. So distressing! So very discourteous! So incredibly impolite! Her Highness wasn’t sure how this had happened. One moment the monkey was gesticulating, oohing, and aahing along, pointing at the gargantuan Starbucks cup prop that Boris had bought on a whim from eBay. The next thing she knew, she was in a very undignified and distressing position. Regardless, it was definitely the last straw. Princess Pricklepants decided it was time to take the monkey on as a project. The monkey must become a genteel monkey, educated in the ways of politeness, manners, geography, figurative language, and related things that would prevent another Starbucks Incident. It would be rather like My Fair Lady, except My Fair Monkey. Soon the monkey would be singing lovely songs about dancing all night, and all would be nice and proper. 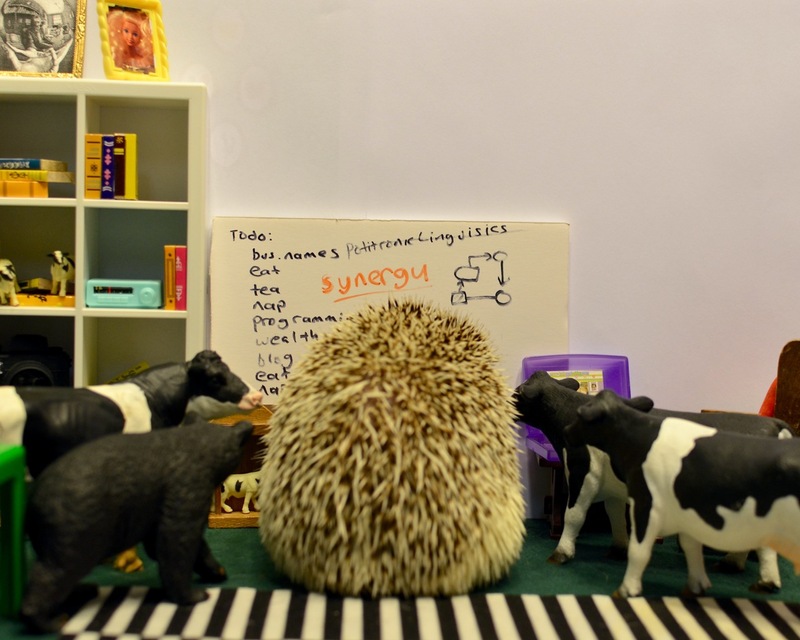 She worked out a lesson plan on hedgehoglessonplancentral.com, set up a classroom in the kitchen, and began her lesson in politeness. “Now, monkey, after you’ve eaten your banana, where does the peel go?” “Oooh ooh, ah ah.” The lesson quickly became very trying due to the language barrier. She called Boris the bear into the kitchen. The monkey threw the sandwich. The monkey left. It didn’t say goodbye or engage in any polite formalities. This was not like My Fair Monkey at all. Jane: Item one, naming the monkey. What should we call it? Jane: Yes, but what should we name it? Jane (cow accountant): Item two. Snacks. We’re totally out of bananas. Boris (bear): It’s the monkey. The monkey is a banana thief! A cruel taker of snacks. Jane: Did the monkey take the three pies that were out this morning? Remember a few minutes ago when we had two dozen donuts? I count eight now. Boris: This meeting is about the monkey. Princess: The monkey is also very impolite. We should discuss monkey manners. Boris: As a bear’s-rights snacktivist, I find eating my food much more serious. Jane: Well, all the items are about monkey business. I suppose we can we just talk about the monkey business, even if it does ruin the meeting format. Princess: So what is the appropriate thing to do in these circumstances? Boris: I move that we send Monkey back to the island. Jane, you can take the monkey in the boat. We’ll wait here. Jane: Boris, you are insufferable. Boris. Label me all you like. I don’t believe in labels. I’ve recently stopped believing in pronouns or adjectives as well. Prepositions are also out. Jane: Moving on… I just looked up ‘monkey business’ on the internet. Do you know how many jobs can be replaced with trained monkeys? I had no idea. We should get this monkey a job. Princess: Monkey, what kind of job would you like to do? Monkey: Ooh ooh, ah ah. Boris: It seems to be saying it wants to make sandwiches. Does some kind of sandwich-making job exist? Princess: Is there a job where they pay you to throw things and be impolite? Monkey is very good at that. Christine (cow safety officer): I don’t think we want to encourage Monkey throwing anything. Seriously. With that decision complete (and us passing 1000 words), it felt like a full day. 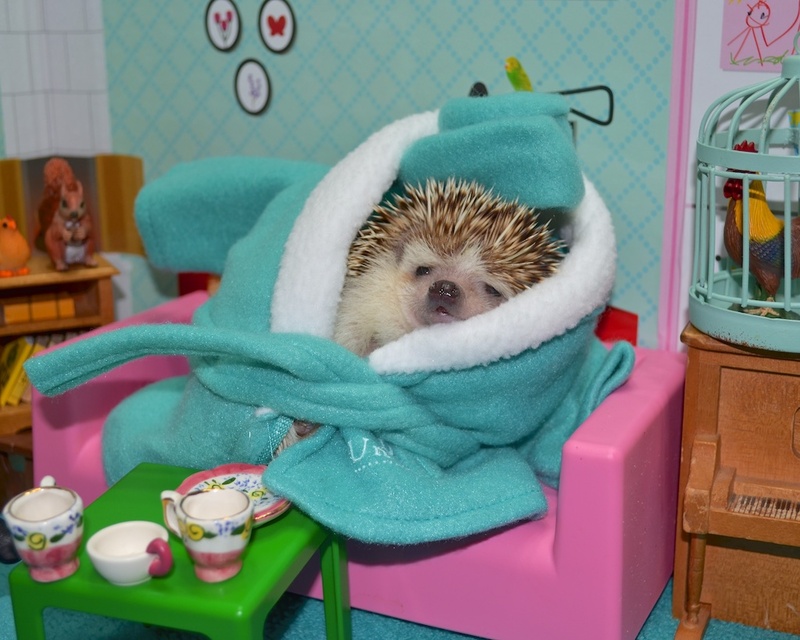 Princess Pricklepants retired to her happy place to read a book. Will the monkey find gainful employment? 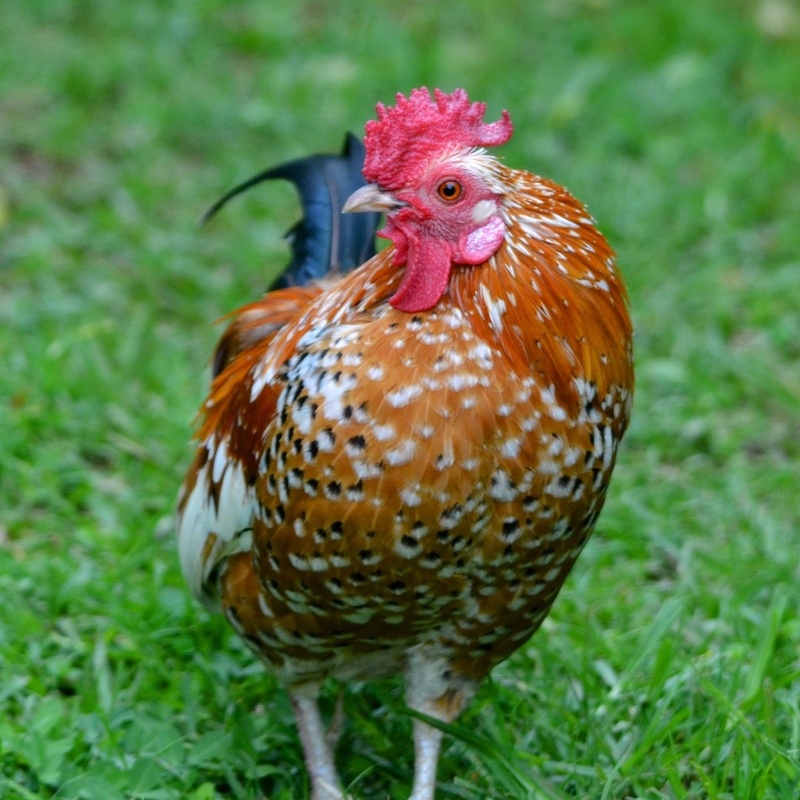 Will chicken troubles appear? Will peculiar and not very relevant photos be forced in? Will chicken crossing road jokes appear? Is a chicken crossing the road poultry in motion? Will they think to ask the strangely-ignored chickens to translate the monkey’s mysterious language? Will they do anything with the Gem of Destiny? Will a tea party involving monkey manners lessons happen? All these and other questions may be answered when the next blog post appears. 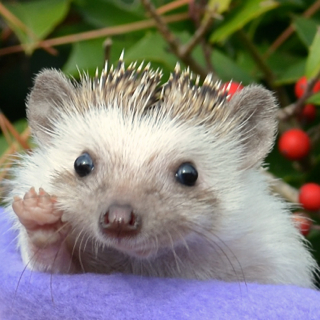 Next: Princess Pricklepants’ Somewhat Distracted Guide to Manners, Monkeys, Etc. Dear readers, first we want to thank you for your amazing patience in tolerating this story that’s extended well past the polite and well-mannered bounds of storytelling. One first thing to note is that the hand servants went to Costa Rica, which was fantastic. While away we saw things, and did things that were unrelated to maintaining her highness’ blog. Her highness elected to remain at home in her dome of solitude as we couldn’t get her passport worked out in time. 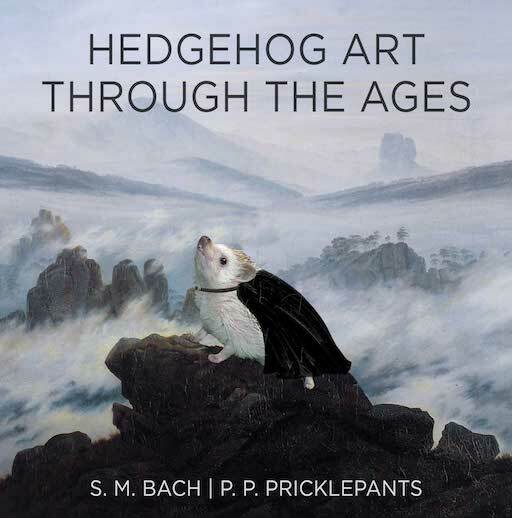 Yes, you don’t need to know this, since it’s not relevant to the hedgehog princess’s quest to discover the Gem of Destiny, but we will make you know it anyway, because it was that cool. Except, wait, we also saw other things like a cool waterfall. 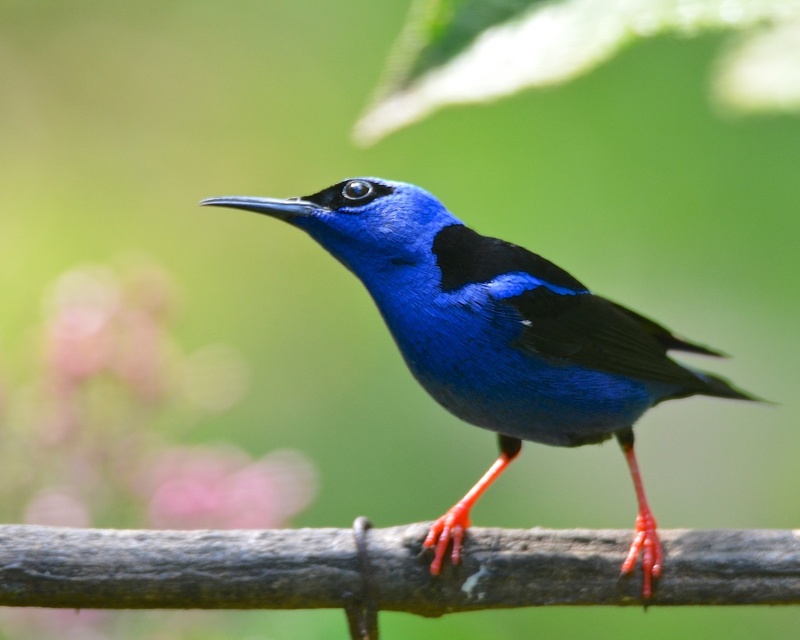 We also saw Costa Rican squirrels and coati, but will spare pushing the photos on you here. Oh, but also one last thing, we saw a lot of chickens. We have a few more firsts to offer before we embark on our tale. As our first first, we have some fantastic news. 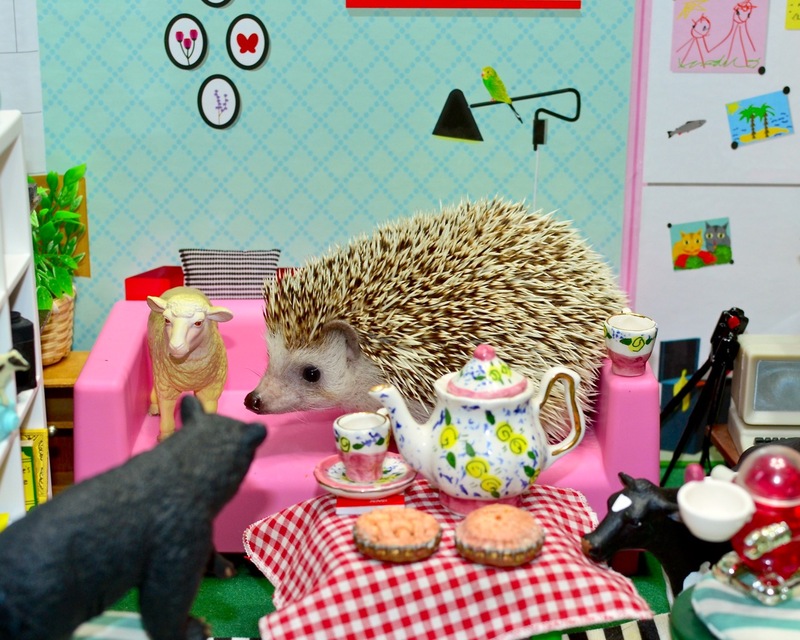 Someone, somewhere searched for “how to be polite at a tea party” and discovered our humble blog. This is an absolutely fantastic thing. As a second first, several readers wrote in to ask whether we were ever going to finish this story thread and go on with other things. Well, no actually they didn’t, but we wish they did. Few readers have written in with anything besides Quentin who wanted to know about whether it was acceptable to end sentences with prepositions. Grammar’s something we have little to do with. Still, answering questions is what we’re made for. So we’ll pronounce that one should never end sentences with prepositions, nor use run-on sentences, and that’s what we’ll stick to. 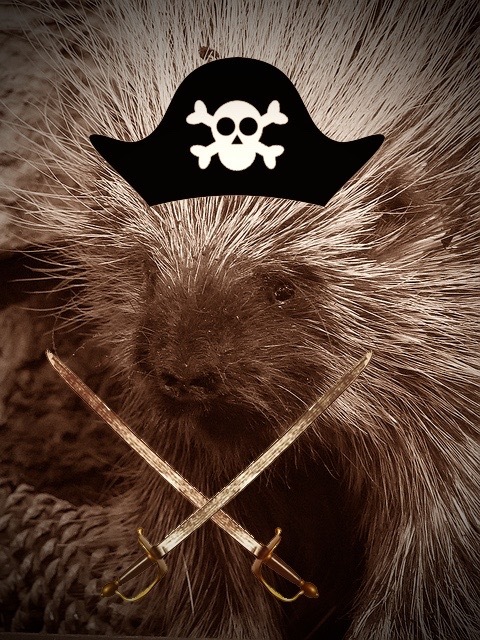 As one post-ultimate first that makes that last first less of a last first, we wanted to mention that our marketing department had pitched the title, “Princess Pricklepants and the Perils of Pirate Plunder: The Grand Denouement’s Ultimate Finale – The Supreme Ending Part I,” but happily that didn’t happen. 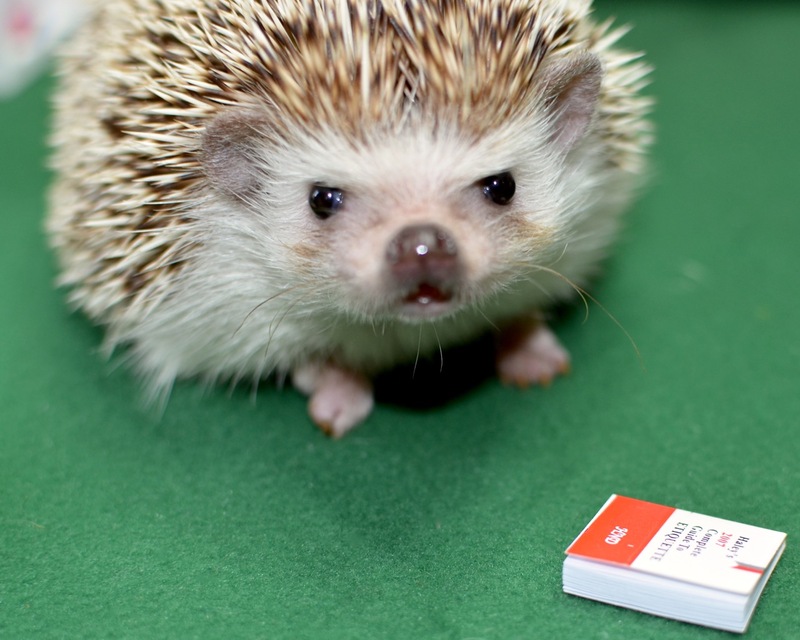 “Princess Pricklepants and the Perils of Pirate Plunder: Ultimate Vengeance – The Final Denouement Part I,” also was rejected. “Princess Pricklepants and the Perils of Pirate Plunder: The Toucan Terror,” was not pitched, though we wish it had been, and are now thinking about a toucan terror episode. And so we begin with our first picture with words under it. With the guidance of Bubo, our intrepid heroes reached Henakau Island. They looked at it, then quickly turned away – having seen it they really wanted to not continue looking at it. They decided to begin their daily Quillbeard Quest meeting as a way to do something that didn’t involve facing that scene. Jane: What does that even mean? “Narrator?” We aren’t characters in some story or play. Can you stop for even a minute with this meta-fourth-wall-whatever business? You’re going to alienate readers. Franklin (calling down, interrupting): Excuse me, can we get to item two? Jane: Yes, good. Item two. The skunk wants down. We will vote. All those in favor? Jane: Decided. On to item three. We’re at Henakau island. Bubo, what do we do now? Bubo: First, make sure we bring Boris as a translator. Also, let’s bring those bottles as a gift. Third, we’ll need to establish some kind of rapport with the locals. Jane: Well, rapport with the cows shouldn’t be too hard. Hope the chickens like bears and owls. Boris: My experiences with chickens have been generally positive. Better than with the toucans. Terrifying things, toucans. Bubo: Chickens should have no reason to fear a large predatory bird. Moonflower: I feel like you guys are ignoring me. Boris: Yes, thank’s, eh. I am deeply concerned – when this adventure began we had a fine start at following a heroic journey – we even had a reference to Homer’s Polyphemus from the Odyssey. There was even a visit to an island with a magician. Everything was copacetic. Then things stopped being copacetic. We have not had an ordeal of visiting the underworld, we haven’t reaped the hard gained rewards from that ordeal – we’re dropping the ball. I propose that we adopt a mission statement: “Homericness.” To live up to that mission statement, I suggest that we tie Princess to the mast while we pass through sirens singing beautiful songs that lead to our death if we hear them. All those in favor? 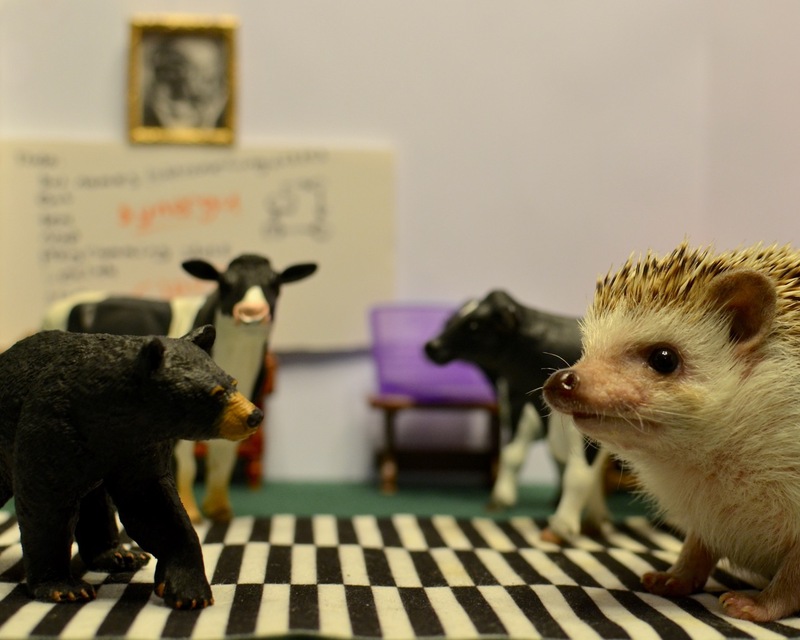 Christine (cow safety officer): While I understand you’d really like to do this, it would involve at least fifteen different violations of Hedgehog Adventurer Maritime Code Section VIII. Jane: Also, a single word is not a mission statement. Boris: Well, could we turn the boat around and be forced to choose either all dying in a whirlpool, or passing under a cliff-dwelling beast that will grab and eat a few of us at random? 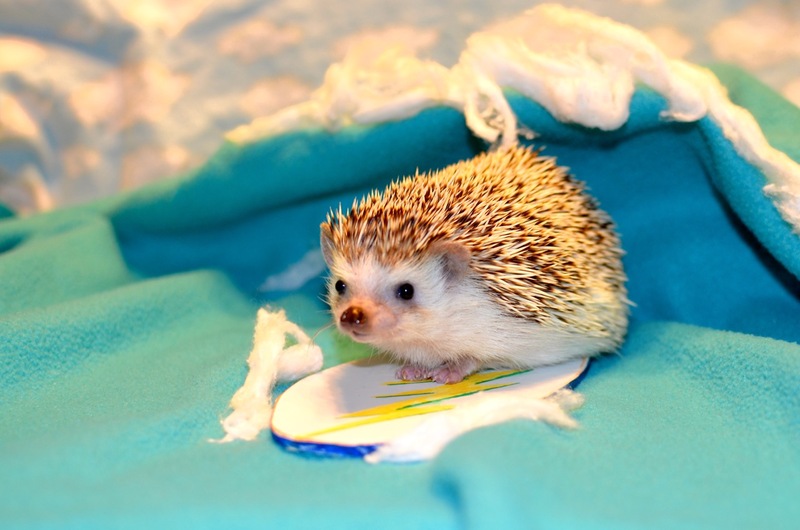 Boris: Since the rules prohibit tying hedgehogs to masts, and the random death by cliff-beast suggestion was a non-starter, I propose a new mission statement: “Gilgameshness.” We shall pick up the narrative themes of the Epic of Gilgamesh. Princess will battle an ogre named Humbaba. (Everyone else at same time): No. Boris: We’re doing it all wrong, you guys… All wrong. I guess we should get back to preparing to debark since we’re at the island. I fear we’re going to be way past our standard word count at this point, especially with all that’s needed to complete this epic. They looked out at the island. It looked remarkably similar to the other islands they’d visited in some ways, other than the inhabitants. They were somewhat interested, yet troubled, due to those inhabitants, and a little tired of islands, longing for living rooms, castles, farms, and other places that weren’t islands. They debarked. A rooster approached. Rooster: Greetings to you, eh. It appears that we finally have adventurers worthy of the Gem of Destiny. Tell me adventurers, what are your names, eh? Franklin: Can anyone understand what he’s saying? 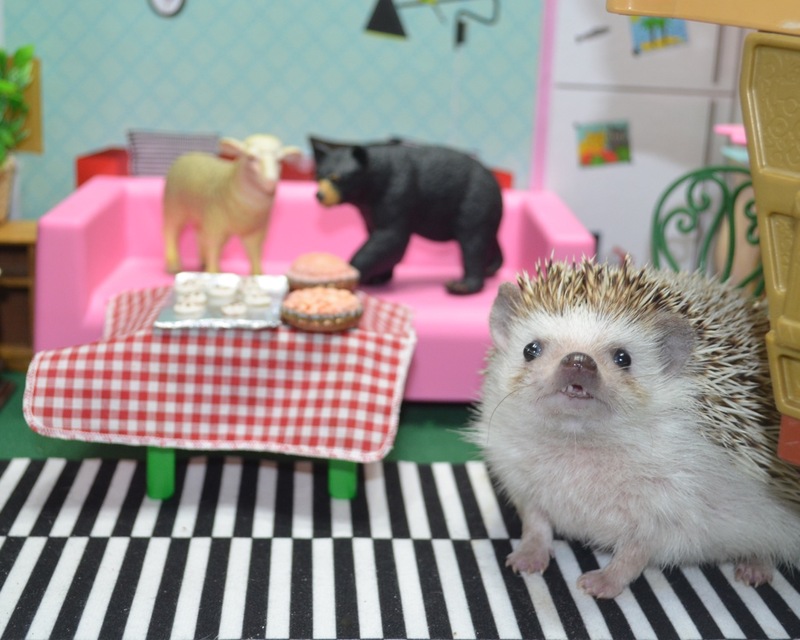 Princess: Oh, well I am Princess Penelope Pricklepants. I have a lovely and extensive title, but we can save that for later. These are my loyal friends who joined me on our quest. Perhaps we could skip listing everyone’s names for now, though? Rooster: All’s copacetic then, eh. Boris: He says that’s fine. Jane: We should give him the bottles. We’re supposed to give him a gift. Princess: O noble rooster who has not yet shared his name, we offer to you these bottles of a fluid we assume to be wonderful as a gift. Rooster: Thanks, eh. Well, we have a tradition here of giving a gift when one is received. Here. Rooster: Oh, the color changes. Here’s an instruction manual, eh. The Gem is pretty easy to use, and can be of great benefit to many if held in the paws of a worthy hedgehog. Boris: No! We are not ending things like this! Princess: What’s the matter Boris? We should be happy – we completed our quest. It would be delightful to return home and no longer live in close quarters with one another on a ship, we can all get back to my house and have a delightful tea party. I could wear my favorite hat. Boris: This is just what I’m talking about – this is no ending, this is a bolted on non-denouement with no dramatic tension and resolution, doesn’t even deal with the question of what the gem of destiny is for. Gratuitous monkey thrown in for no reason. No pirate theming. No fulfillment of the heroic quest. It’s a travesty! An outrage! I thought I was in some kind of existential nightmare, but I see this is far worse. This is postmodern! But being trapped in a postmodern work is an existential torture, so it’s even worse. Jane (still in a poor mood from the long journey, and having not had a proper cup of tea in ages): Boris, let me offer you this sign from the universe – her death-facing trial was having to listen to you. Boris (mumbling): That’s not even how the universe works. 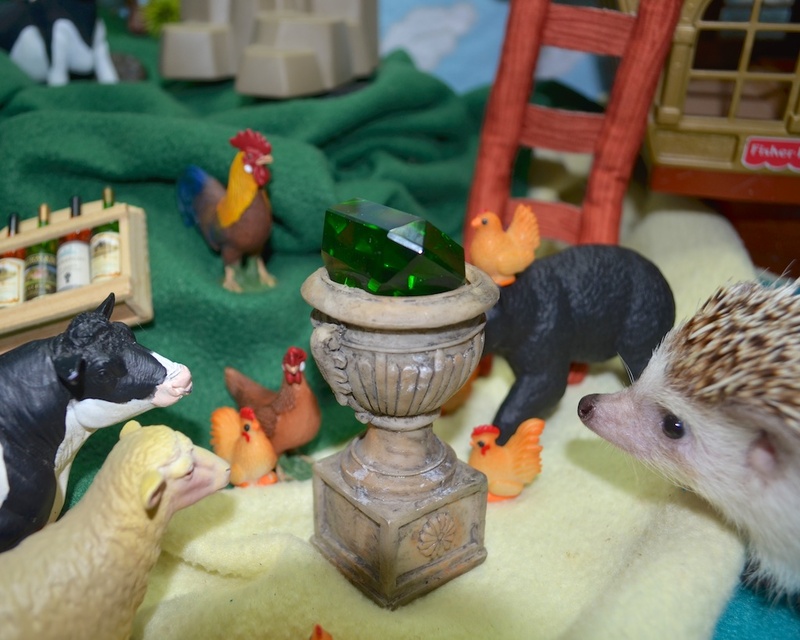 Princess: Well Mr. Rooster, thank you so much for the gem, we appreciate it, and really want to get home, so bye. Rooster: Say, could you give us a lift back to civilization, eh? I think we’re done, and it’d be nice to just live on a farm. Since the first days our ancestors have passed on a tradition of explaining how it’s not all that nice, and it’s much nicer on the mainland, eh. 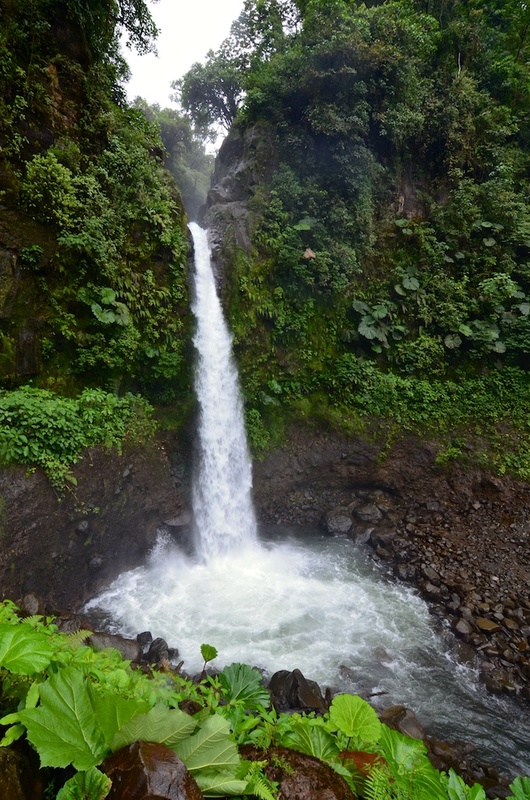 This isn’t even a cool island where there are toucans, and cool birds (besides chickens), or waterfalls. Boris: I refuse to translate. This is killing me. 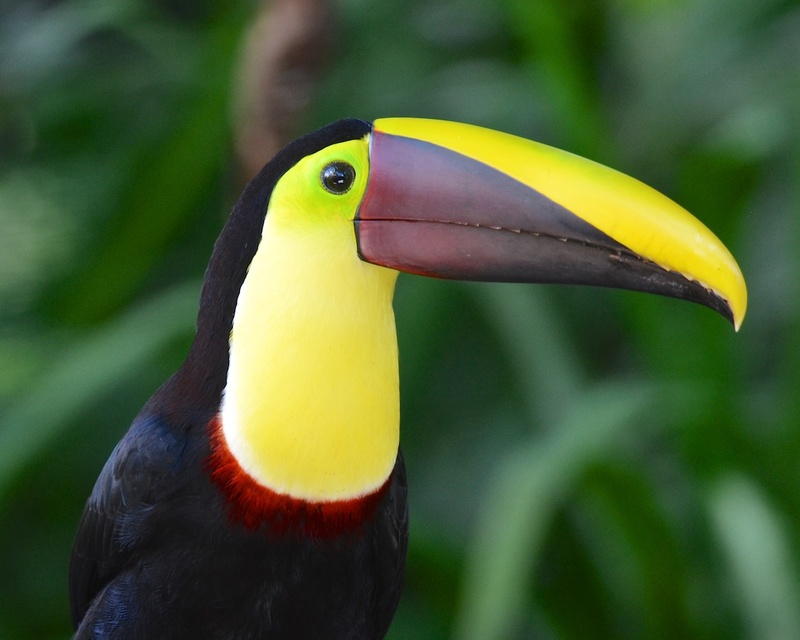 Also, toucans aren’t cool birds. Jane: I think he said they want to come back on our ship… Mr. Rooster, peck once if this is correct, twice if this is incorrect. Jane: You’re sure about the monkey? Princess: Of course we can take you all (including the monkey) back to our vaguely-defined country/place of residence, it would be a pleasure. They packed up, boarded, and most sighed with relief that they were done except for the trip home. The sigh of relief was very short lived. 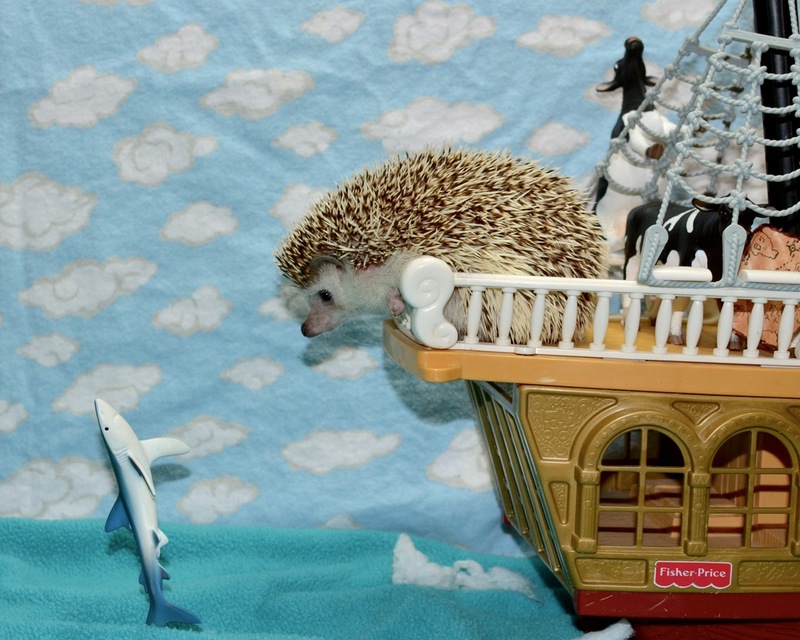 Stay tuned for our post-ultimate finale episode: Princess Pricklepants and the Perils of Pirate Plunder: The Long and Tedious Ship Ride Back (working title). Will they resort to fisticuffs? Will Boris come to terms with his crisis of existing in an existential post-modern drama? Will we just skip that episode and call this the final finale? Will the author ever learn the meaning of the words “first” and “last?” These and other questions may be answered at some point in the future when the next blog post appears. 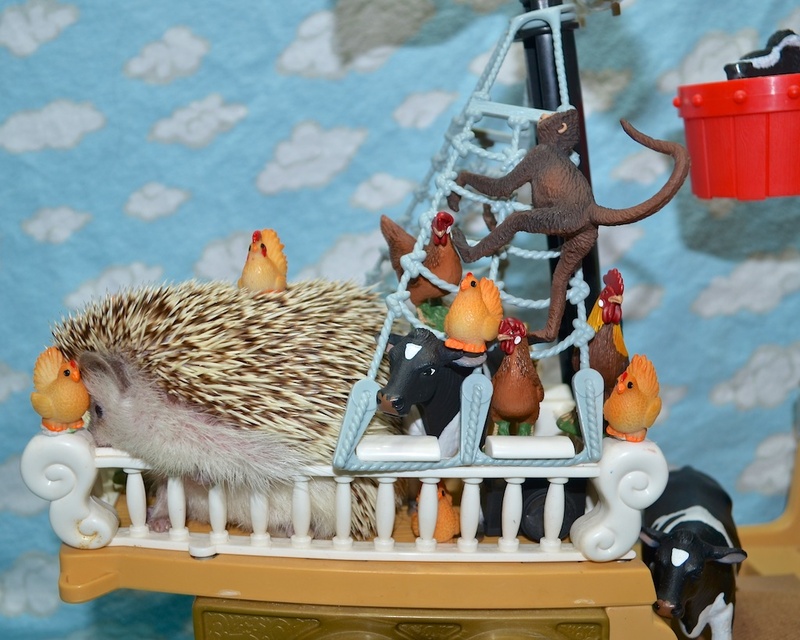 Boris: I’m going to write a haiku about how unbearable it is to be on a ship laden with chickens. Jane: Of course you will. Hey, what do you call bears with no ears? Happily, and/or sadly, nobody has sent us any correspondence, so we have no reader responses to offer. We did find one search that led someone here for “how to have manners like a princess.” I’m sure we were very helpful. Someone also came here looking for “pleasantries synonym.” I assume they found what they were looking for. …and hung out with their old friend Moonflower the sheep from back in the farm days. One of the robots, Redbot, had moved in as well, to help as a personal assistant, tea connoisseur, and generally nice robot. 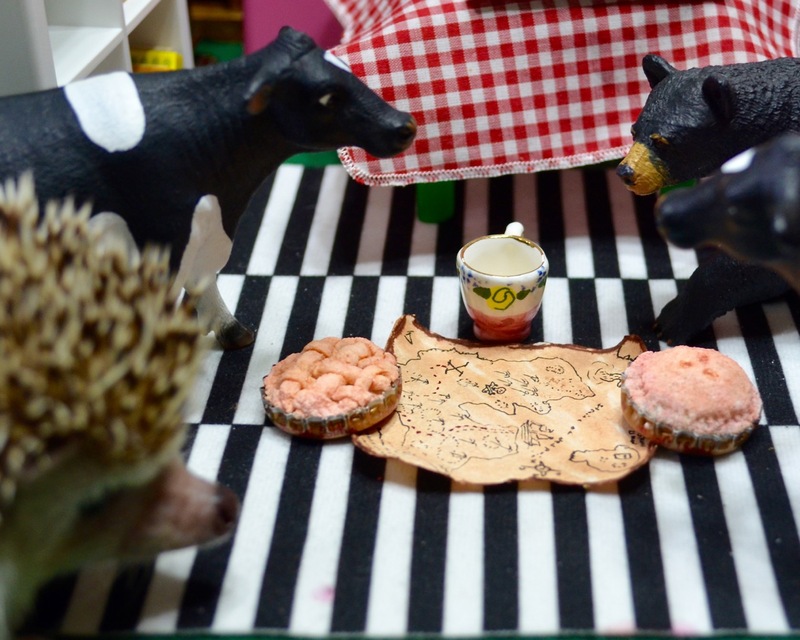 One day, while having tea and enjoying some truly delightful baked goods, Bessie, the generic cow and robot programmer, had a suggestion. They were impressed. It looked like it must have taken someone a fair bit of work to make that map. Also it clearly indicated something important. The story told by the mysterious ancient web page seemed like typical pirate fare, but had some interesting information. Unfortunately that was all she could find, and all the links on that page to other notable things were broken. Jane was concerned. “OK, so this is one of those things we can’t just wrap up quickly, like most things. So we need to actually for the first time in our lives have a plan. And we have to make a real plan.” She was still recovering from her tech. career, and thus began most sentences with either “OK,” or a conjunction. They ordered rope, shovels, metal detectors, food, and boat-related supplies from hedgehogtreasureseekercentral.com with free two day shipping, then sat around for two days binge watching Adventures of Sonic the Hedgehog on Netflix and baking macarons while they waited, except Bessie who worked on reprogramming Redbot to serve as a Henakau protocol droid. 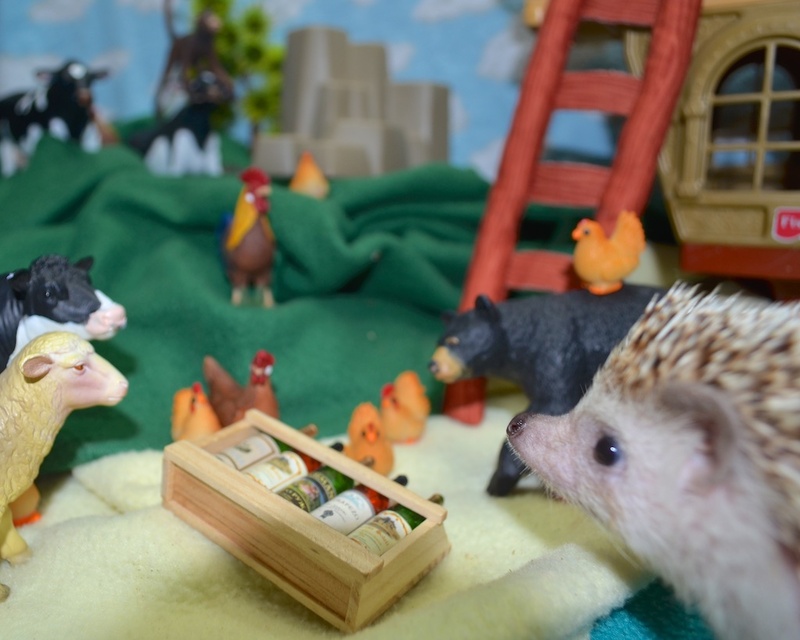 Princess Pricklepants, Boris, Moonflower, Redbot, Bessie, and Jane prepared for adventure while robots loaded the ship. 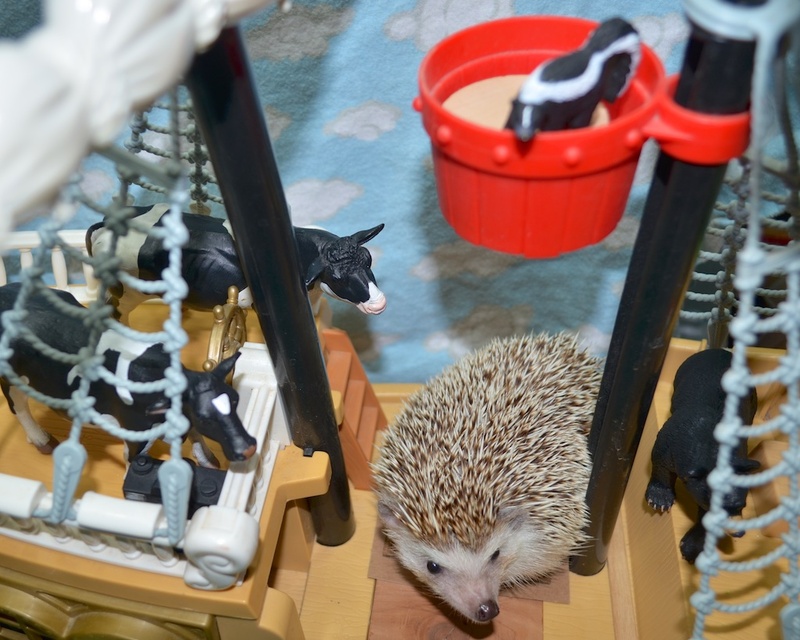 Boris began to think about explaining that you could have many adventures with helicopters, but then realized that using a pirate ship to seek out the treasure would add extra symbolism that would enhance the narrative. He then worried that there wasn’t a proper call to adventure, as a conversation over tea and cookies was barely a call to adventure at all. He thought about many other things as well, but we won’t dwell on them here, since the literary thoughts of bears are not the point of all this. While he thought about pie and came up with a plan that didn’t involve eating more pie, but would help the narrative. Boris pulled out his cell phone and called Princess. 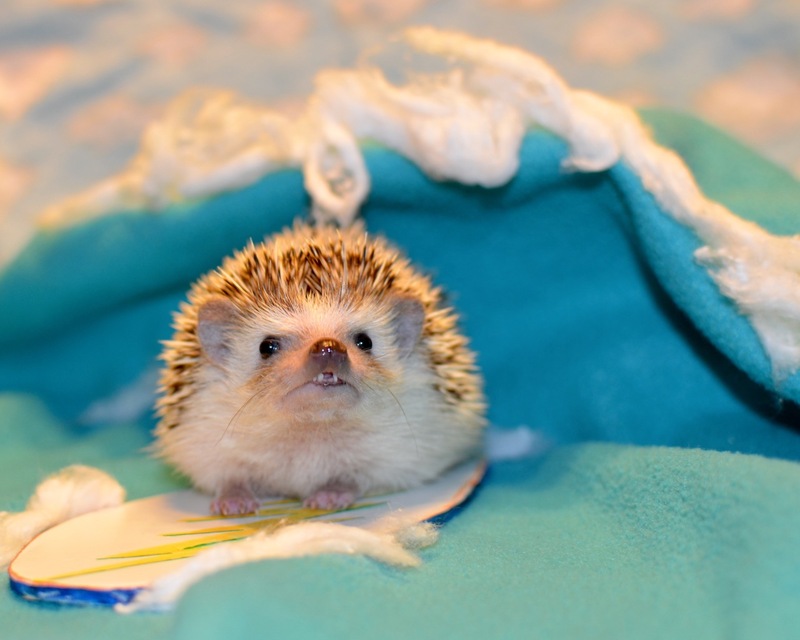 “Hello, this is Princess Pricklepants, hedgehog adventurer, who is calling?” (She was still working out etiquette for answering phones, she really preferred texting, where manners were easier to understand). With that settled, they were ready to go. 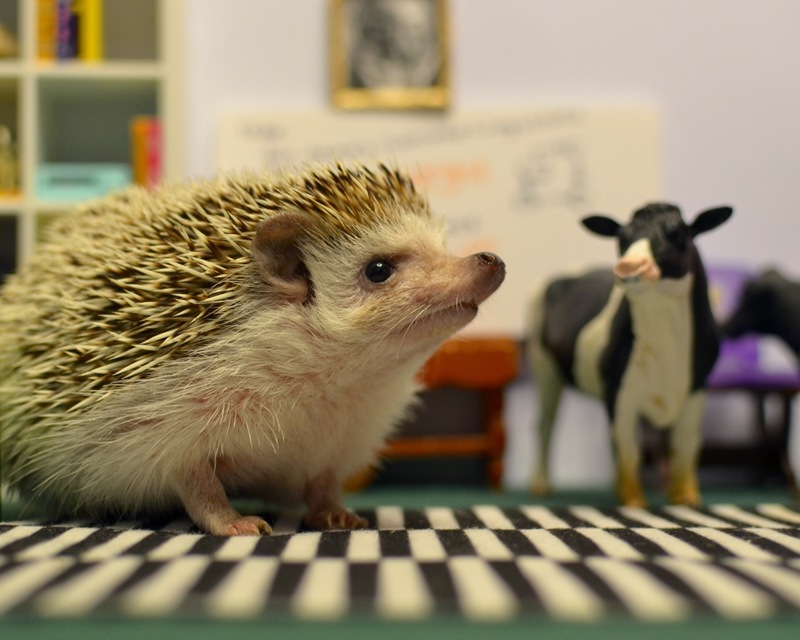 Boris was not fully satisfied, and was also annoyed that that last photo put the hedgehog in focus and left him in the background, but figured it was a start. 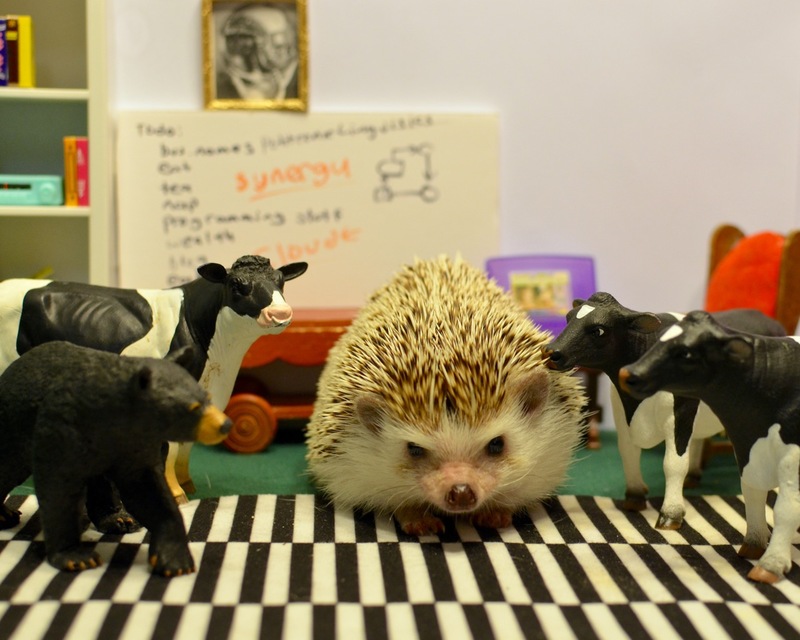 Boris knew they needed to meet a wise person to mentor them at this point for everything to work out. He figured they’d met Moonflower recently, so that was pretty close. Things were going swimmingly, except with a boat and ideally no swimming. They prepared to board and begin their journey. Dear reader, perhaps you are thinking to yourself, “Hmm, this is odd, I thought they just posted a thing a couple days ago. Don’t they usually drag their feet and delay for at least a week and a half before posting a second thing?” If you thought that, you are slightly in error, as in the past 586 days since we started, we’ve posted 92 things, which comes to an average of one thing every 6.3 days. Sorry about the math. Anyway, out of those 92 things, we’ve scientifically determined that 29 were basically empty posts of a picture or something, so if you subtract those, it comes to a post every 9.3 days, so yes, you’re right, really. Sorry for saying you were slightly in error. 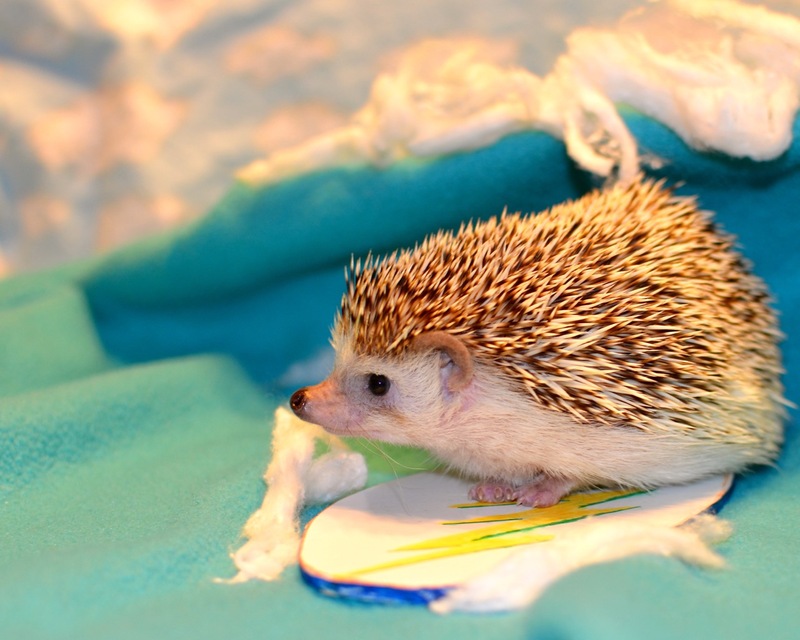 But, fear not, because this is actually a throwaway post with some pictures (and scientifically verified to not be a story due to the lack of cows or dialog) in which we display lovely photos of Princess Penelope Pricklepants surfing. We had at one point thought about doing a Point Break style story, but realized that as a part of our research we’d have to actually watch that movie, and that’s just too much to ask of anyone. With that out of the way, here are the pictures we narrowed things down to for the 2015 Carolina Storm Summer Photo Contest, along with one that we took later when Princess Sophie suggested it. Dear reader, for our preamble we’d like to say a number of fascinating, witty, clever, and delightful things, but we can’t think of any. Sorry. A reader contacted us indirectly with a really brilliant idea that we can’t tell you about. Also, sorry. Quentin emailed in to say something, but we haven’t read that email yet. We’ll do that really soon, though. Our awesome and brilliant reader Mike sent in this superb graphic, which you should all admire, and which we plan to develop into a theme once Princess runs for President, which now must happen. On a separate note, we found someone reached our blog via a search for “when adventure trip on a ship. how can we do good manner.” Cool! And so, we begin our story with a picture with some words under it. Princess Pricklepants gathered the council of cows et al. to pitch her latest idea in the living room. Startups were supposed to be in garages, but she didn’t have a garage, so the living room would have to do. 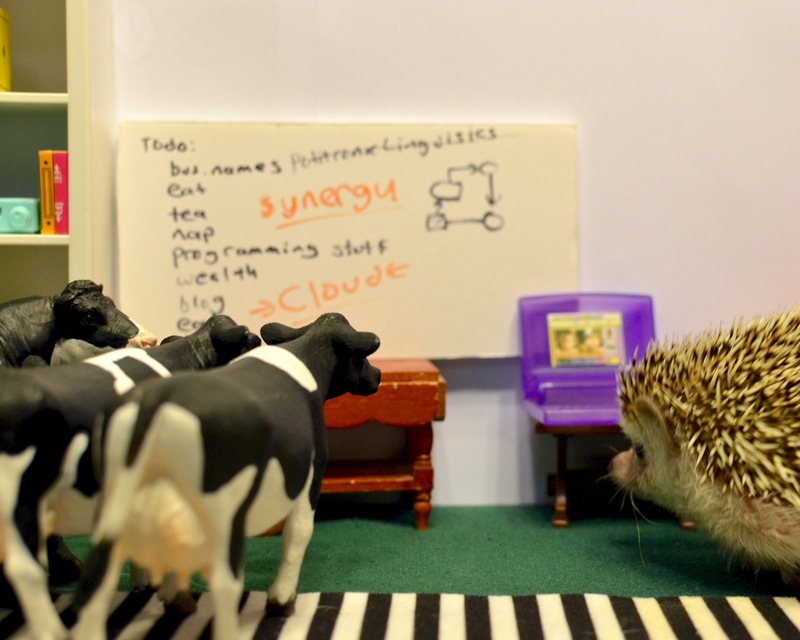 “Princess Pricklepants-pedia – an online encyclopedia of all things related to me.” Jane, the cow accountant and general downer, explained that this sounded like a really fun idea, but had the problem that there was no way to possibly ever make money. Princess turned to google “polite web startup ideas,” but the first result was an article titled, “Polite, Purposeful People Create Startups That Fail.” Clearly google was confused. This was not well accepted. Nobody could think of an objection, or if they had one they couldn’t find a polite way to say it (since the software didn’t exist yet), so they started their plan. Their plan had three parts. 1) Develop dynamic MaPaaS cloud platform. They googled it to make sure nobody had already taken the name. Clear. They still needed to register telstaretiquettronics.com, but would get to that soon. She then checked wikipedia to make sure this was correct and wound up reading about grizzly bears for a while, then salmon, then the Yukon river. 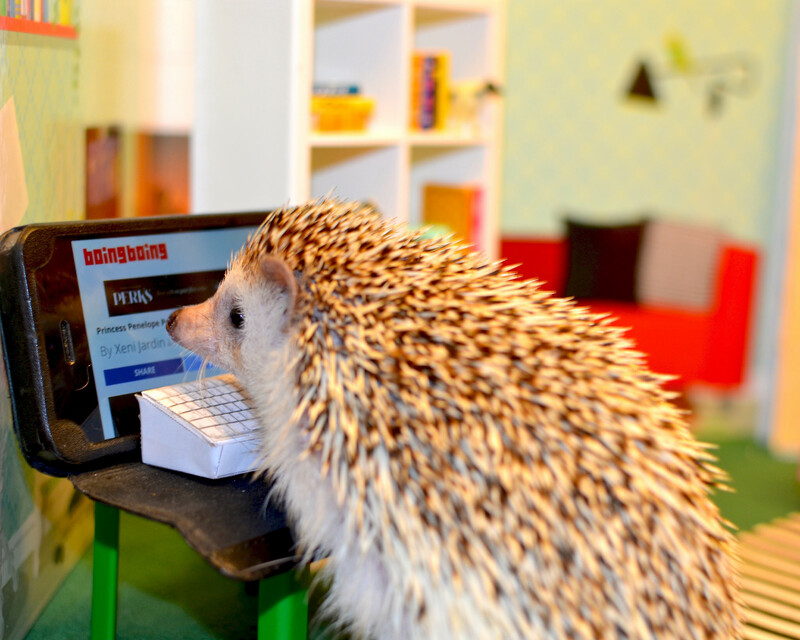 Then she watched an amazing hedgehog video. Then she visited boingboing.net. Eventually they got to working on part 1 of their plan. Princess hit the books. It was so boring, though. All those letters and words that didn’t quite mean the right thing, and the jargon, that odd almost, but not quite English jargon. Even with a montage this would be unbearable. So they decided to find a programmer. While Mufiki, King of the Planet of the Baboons, might not have seemed like an immediately obvious choice, he had previous experience as a software engineer for a web company in the dot com days. He was interested and would take low pay in exchange for equity. Soon he had something running. We’ll spare you the boring details of a code monkey. He also wrote a module to measure how polite or impolite something was that was named polite-o-tron2000 that applied machine learning with vectorized Bayesean analysis on natural language processing, text analysis, and computational linguistics on the works of Emily Post on a Hadoop cluster (this obviously was a Big Data problem) to assign a score from 1 to 10, where 1 is something we couldn’t possibly say, and 10 is something really, really polite and appropriate. Sorry, had to throw in boring details. Princess texted her reply, “When taking an adventure trip on a ship, always be sure to share treasure maps with any cows that want to go on the adventure with you.” It went through the internet tubes and showed up in their software thing where it was supposed to. polite-o-tron2000 ranked it a 10. They were cooking with gas! Many other things happened, but they were dull business things that nobody in their right mind would ever want to read about, let alone suffer through in real life, so we’ll skip to the interesting part – getting funding from venture capitalists. They showed up at Yoyodynamic Capital to pitch their business. They did a great presentation on how Telstar Ettiquettronics was the premiere MaPaaS business in the industry, with exponential potential for growth, and presented their highly relevant buzzword catch-phrase – immersive big data and well-mannered disruption of advice columns through the mobile cloud, and also social media. Negotiations were tense, but they were ultimately funded with a lot of money to start a business in ways that were complicated to explain, but which Jane, the cow chief financial officer thought were workable. 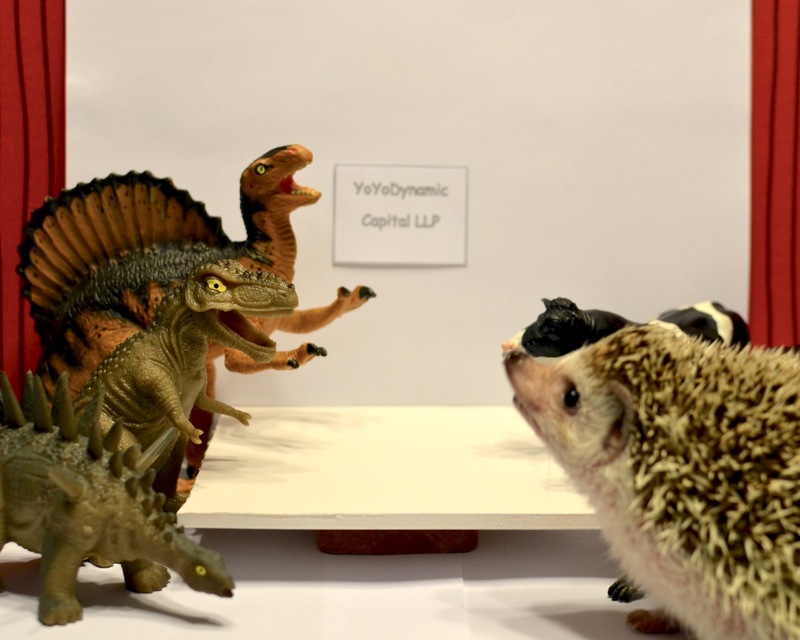 Yoyodynamic Capital even forgave Princess for climbing on the table. Thus they were probable tech millionaires. Maybe. All they had to do was make an actual company with customers, a long term manageable strategy, and a way to make a profit – easy.